I couldn't wait to take Danbo out today to start his adventures. His first one begins with an autumn leaf..He is so cute! I am loving the bokeh in this shot too. This is really awesome. Mind if I used this as a drawing reference? I solemnly swear that I'll give you credit if I post this anywhere on the Internet. were did u get himmm!!!! he's so CUTE!!!! hahaha awesome, where do i get this "toy"? Great shot! And the bokeh is perfect! Ok very cute. 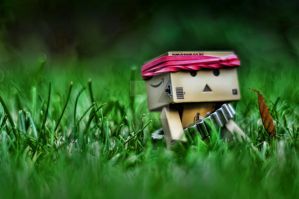 But what in Danbo? Aw, it's too cute! I love it! Neat work, like the colors a lot..
Great shot. I know it's hard to get that close. As always, fabulous work!